The Kohl’s US Youth Soccer American Cup, a program to highlight recreational soccer players and promote fair play, is once again proving to be a major success among the recreational members of US Youth Soccer. Numerous Kohl’s American Cup events are scheduled for 2010, from Florida to California, and the one thing each of them have in common is the goal of providing all participants with the opportunity to experience a consistent and high quality statewide tournament in a fun, festival-like atmosphere. It is the Kohl’s US Youth Soccer American Cup philosophy that all players should receive equal opportunities and benefits within their level of play. All players have the right to participate in competitions where they can develop and exhibit their skills while enjoying themselves. The Kohl’s American Cup provides recreational players this opportunity and places emphasis on participation, as opposed to competition. 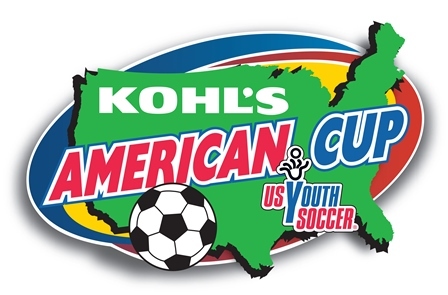 About Kohl’s American Cup - The largest recreational youth soccer organization in the United States boasts more than 65,000 participants and more than 100,000 attendees annually since its inception in 2000. Fifty-five state organizations provide youth soccer players an opportunity to experience a consistent and high-quality statewide tournament in a fun, festival-like atmosphere. About US Youth Soccer - US Youth Soccer-The Game for ALL Kids!® is the largest member of the United States Soccer Federation, the governing body of soccer in the United States. US Youth Soccer registers more than three million players annually, ages 5 to 19, and over 900,000 administrators, coaches and volunteers in 55 member State Associations. US Youth Soccer programs provide a fun, safe and healthy environment for players at every level of the game. For more information, see www.USYouthSoccer.org. About Kohl's - Kohl's is a family-focused, value-oriented, specialty department store offering quality exclusive and national brand merchandise to the customer in an environment that is convenient, friendly and exciting. Kohl's has over 1,000 stores in 49 states! Visit Kohl's online.